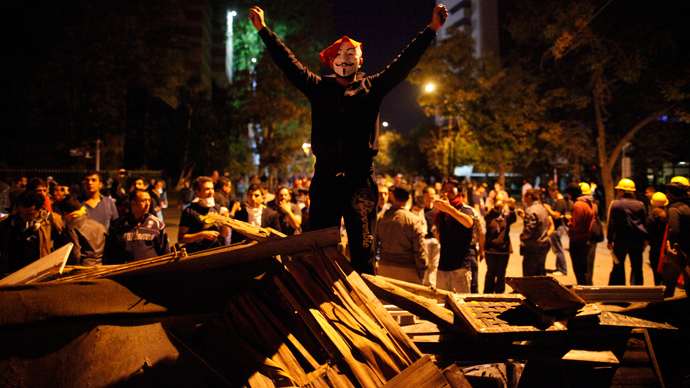 Turkish protesters remain defiant after Prime Minister Tayyip Erdogan declared that the disturbances must end within 24 hours. 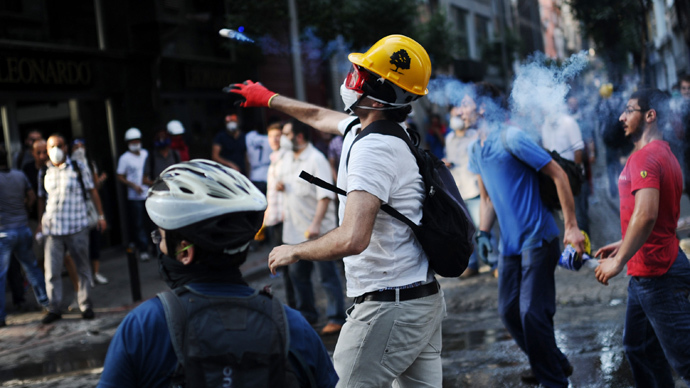 Overnight riot police used tear gas and water cannons to break up activists in Ankara as they built barricades. 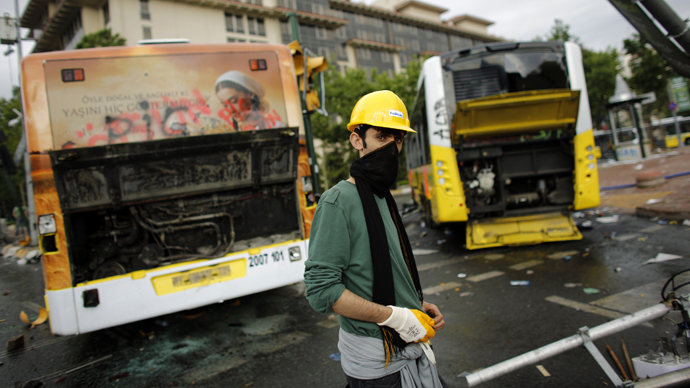 He added that the protests were hurting Turkey’s image and economy. Meanwhile, Turkey’s Ruling Justice and Development Party (AK Party) Deputy Chairman Huseyin Celik has said a referendum might be held to decide whether to build replicas of Ottoman-era barracks in Gezi Park or leave it as it is. Erdogan’s deadline is unlikely to be observed by the protesters, reports RT’s Irina Galushko from Istanbul. Following PM’s statements, activists at Taksim Square were chanting and singing in defiance of his order to leave. 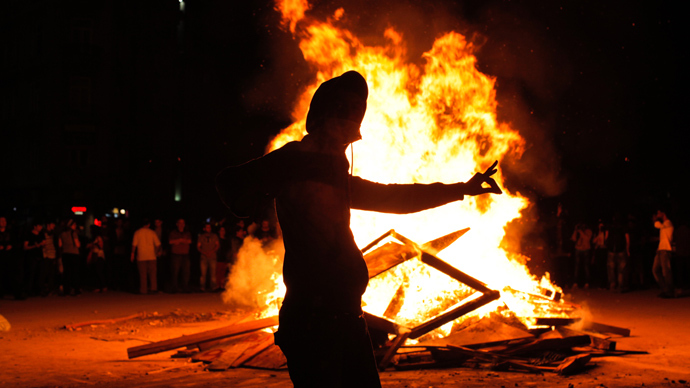 The city was relatively quiet overnight, but the capital Ankara saw its fifth night of rioting in a row. There police again used tear gas and water cannons to break up some 2,500 protesters, as they were trying to erect barricades on a road leading to government offices. Earlier on Wednesday the Turkish Prime Minister spoke to a group of 11 people as part of the government’s attempt to listen to the demands of the demonstrators. The participants included artists, academics and students, as well as the Interior Minister, Environment and Urban Minister, Tourism and Culture Minister and the vice chair of the ruling Justice and Development Party (AKP). As the PM spoke, another group of protesters prepared to assemble on Taksim Square, just a day after thousands of like-minded people were driven back in a night of violence, complete with tear gas and water cannon. The police had invaded the square twice on Tuesday. In the 12 days of anti-government anger, three protesters and one policeman have lost their lives, prompting Turkey’s Human Rights Foundation to open an investigation into excessive use of force by the police. The number of injured stands above 5,000. Elements within the protest camp appeared not to waiver in the face of Erdogan’s warnings, with the Taksim Solidarity Group – an umbrella unit representing the protestors – urging the crowds to return to the square at 7PM. The group reiterated its earlier demands, which included for the government to cancel plans for destroying Gezi Park, just meters away from Taksim Square; for police chiefs in cities with a particularly high rate of violence against protesters to be sacked; and for the release of those that have been detained over the 12 days. The group of 11 people who spoke to Teyyip Erdogan included celebrity activists too – among them a noted actress and a singer. But the Taksim Solidarity Group has said the celebrity connection was useless as long as police violence continued. The country’s President, Abdullah Gul, who has been known for being more lenient than the prime minister in the midst of the protesting, has tried to unite the bickering sides, urging them to open a dialog free of violence, and for the more extreme elements in the protest to stop their anti-social behavior. High Representative of the Union for Foreign Affairs and Security Policy for the European Union, Catherine Ashton, also opposed the way in which the situation was handled, encouraging an investigation into police action and criticizing the government’s social media blockade. RT spoke to a blogger and protester who bore witness to the events of the last 12 days. Arzu Geybulla is very skeptical of any compromises or sudden changes expected over the next day, given the Turkish PM's prior promises of bringing the violence to an end. In light of this, Geybulla added that the outcome of events in the next 24 hours will depend solely on police action.